Amandla! A Revolution in Four Part Harmony release date was Wednesday, February 19, 2003. 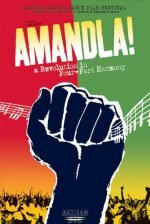 Through a chronological history of the liberation struggle in South Africa, the documentary cites examples of the way music was used in the fight for freedom. Songs united those being oppressed and gave those fighting a way to express their plight. The music consoled the incarcerated and created an effective underground form of communication inside the prisons.